*DISCLAIMER* My experiences teaching in Costa Rica have only been at two academies and within the Central Valley. I’ve only worked for places that don’t offer work visas and I wasn’t required to be TEFL certified due to my background in teaching/writing. This blog post details my experiences and draws from the experiences of 3 close friends. I’ve heard similar stories from several different teachers however, so if you’re thinking about teaching English in Costa Rica it’s worth reading what I’ve written below and doing your homework before deciding on an academy to work at. 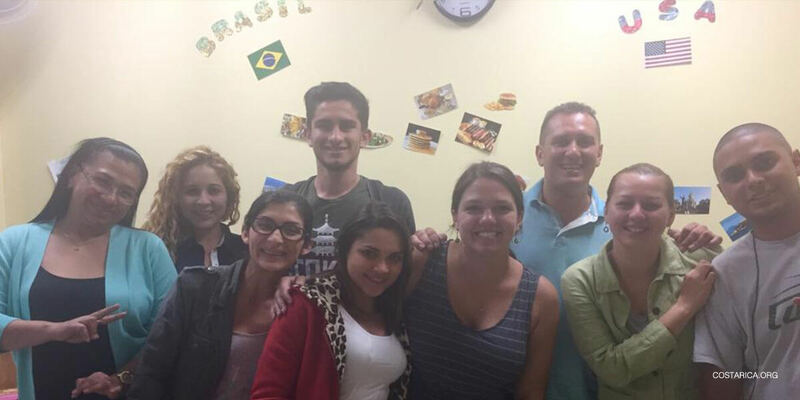 I came to San Jose, Costa Rica to teach English in August of 2016, three months after I graduated from college. For 6 months I taught full-time for an academy called New Learning Academy (located in Guadalupe and San Pedro) before I was hired as a full-time Executive Assistant. I continued teaching part-time at night for another 6 months with a different school that offered business classes. All of my teaching experience was in San Jose, so keep that in mind if you’re thinking about teaching in a more rural community or on the beach. After a year in Costa Rica I stopped teaching English and it was honestly a huge relief. Teaching English was fun, stressful, hilarious and miserable all at once. The teaching part of the job was an amazing learning experience and something I’ll cherish forever. I loved my students. Most of my them were adults who chose to take English classes in addition to full-time jobs, so although they were usually tired, they were always engaged and excited about learning. I also got to be creative with my lesson plans and I learned a lot about teaching a language. Unfortunately, teaching English in Costa Rica, at least in San Jose, is not just teaching. It’s commuting in the rain, fighting with your boss (who is definitely doing something illegal), working on Saturdays, being underpaid, and dealing with unqualified and greedy administrators (I’m looking at you, New Learning Academy). It’s also learning how to be considered disposable and accept that you have virtually no rights as an employee. When you’re teaching English in language academies you’re usually teaching adults who are studying for their GED, trying to get a better job or just attempting to conquer a new skill. As a teacher you get to connect with them, make friends with them and watch them improve every day. It’s an exhausting job, but you know that you’re doing something worthwhile. I genuinely loved my students. Many of them became friends. In fact, I often went out with them because they were the only locals I knew. They were eager to learn, curious about my life and hilarious. I rarely had problems getting people to participate in activities and their motivation often kept me going during classes. There were exceptions of course, but not very many. Most of my teacher friends had similar experiences. My closest friends still talk to their old students and several of mine still comment on my social media updates. If you can speak English, you can find work in Costa Rica. (That doesn’t necessarily mean you’ll keep your job though, I’ve seen a lot of bad teachers get fired). Between academies, learning centers, business classes and private lessons there are several avenues available for teachers. Of course, some are more legitimate than others. One way to know how professional and legitimate an academy is if they require that you have/get a working visa. If you’re working legally the school is required to treat you with the same rights as Costa Ricans. Usually these types of schools also require more training and experiences from their teachers (think TEFL/TESOL certification, background in teaching etc.). Many academies throughout the city will still hire you without the visa and pay you under ‘professional services.” It’s not a bad gig honestly, at least for the first few months. You don’t make enough to pay taxes but as long as you maintain a full-time schedule you’ll make enough to get by and even travel off and on. Without a visa you are only allowed to stay in the country for 90 days, which means going on visa runs—AKA vacations required by law–every 3 months. When you’re first starting out, visa runs are a great way to explore countries surrounding Costa Rica. I’ve taken some pretty stellar trips to Nicaragua and Panama. Flights to Guatemala, South America and southern US states are usually pretty cheap too (I’ve seen flights to Guatemala for $100). Technically you have to stay out of the country for 3 days (although that’s avoidable too, I’ve left and returned in the same day), so you can get a long weekend out of it too. Because you’re not on the pay roll, you don’t have a strict number of vacation days that most full-time jobs require and it’s pretty easy to travel. I probably had the most ideal schedule available and I’m still grateful for it. Many teachers worked Saturdays, had more back-to-back classes and less business classes (business classes paid more at my academy). I had long breaks in the afternoon which allowed me to work out, lesson plan and nap. Classes tend to open and close a lot so your schedule is bound to change. For a while I only had morning classes twice a week, but two classes on Saturday. This could be good or bad, depending on your perspective. In my opinion learning how to live on a low salary (at least compared to the US) is a great tool for young adults just out of college. English teachers tend to make $700-$1000 a month depending on where and how often you’re working. Rent is anywhere from $250-$500 a month. I’ve met teachers who could not believe how low the salary was and couldn’t make it work. They didn’t tend to last. However $700-$1000 a month is a decent salary in Costa Rica, especially considering that most teachers are working illegally. When I was teaching I made it work by taking public buses, walking to class regularly, shopping at the farmer’s market (OK if I’m being honest I was too lazy to go very often, I usually opted for the more-expensive produce from the grocery store) and being generally frugal. I earned $850 a month and I traveled, went out to eat regularly, paid my phone bill and rent, and bought new clothes and shoes when I needed them. I even paid for a few tattoos and a gym membership. I will say though, that it is impossible to save money. I maintained between $200-450 in my account. I did have to use my savings account in the US to pay for flights home and some emergencies. It’s also not enough to be paying off debts, so keep that in mind. In San Jose many teaching jobs take place at various businesses all over the city, rather than at a school. At New Learning Academy I had on-site classes in both locations (about a 30-minute walk apart, or 10 minute bus ride) and in businesses. My business classes were all over the place. I had one in Tres Rios, one in Barrio Cuba and another in Escazú. A few of my friends taught in Heredia and Cartago (suburbs of San Jose). San Jose is famous for having terrible traffic. During rush hour it took me 1.5-2.5 hours to go three miles on the bus. Longer if it was rainy season (May-November), or there was a traffic accident. My fellow co-workers and I were unlucky because one of the buses we needed to take between locations and to many businesses is notoriously slow and it wasn’t uncommon to wait 45 minutes to take a 10-minute bus ride (that’s why I preferred walking). For my class in Tres Rios I walked 30 minutes to San Pedro, waited for the bus for 10-20 minutes, rode for about 10-15 minutes and walked for another 10 to get to the class. I usually left around 3pm for my 5pm class. And that was considered a relatively easy commute. Classes in Heredia and Cartago can take at least an hour to get to—at least. A friend of mine recalls commuting 3 hours round trip to teach a 1.5 hour class. During the rainy season it’s absolutely miserable to commute. Five steps out of your house, your feet are soaked. The busses fill up quickly and nobody wants to open the windows so you’re basically riding in a sauna. On top of all that, traffic inevitably slows down to a crawl. Then you’re forced to decide if it’s better to walk and get completely soaked or sweat through all your clothes–only to get soaked anyway walking from the bus stop to either your next bus or your class. The teachers who complained about the low salary usually opted to order Ubers, but it’s not a sustainable option economically (or environmentally for that matter). Several academies offer car transportation to off-site classes, but you’ll still spend a lot of time in traffic. Academies do not compensate you for your hours spent commuting. Walk 5 minutes to bus 1, 15 minute bus ride. Walk 20 minutes to bus 2, 10 minute wait, 10-25 minute ride. Walk 7 minutes to site. 7:15-8:35 (I was usually late to that class). Repeat in reverse. Usually arrived home around 12:30. So far that schedule is 38.5 hours teaching and 11 hours commuting per week. This does not count the tutorials and classes we were required to substitute. Wow, I could go on and on about how corrupt the language academies are in Costa Rica (still looking at you, New Learning Academy). The main problem is that most schools hire teachers illegally because the visa process is too long and difficult. Unless you’re willing to shell out a lot of money for an immigration lawyer, it can take up to 18 months to be approved. It is much easier for schools to pay you as a consultant under “servicios profesionales”. It is completely illegal, but both parties benefit. Schools get away with not paying taxes on your salary nor offering benefits and teachers get a fast and easy way to make money. Businesses are technically required to pay 30% of every employee’s salary to the “Caja de Seguro Costarricense”, but if they contract teachers under servicios profesionales they don’t have to pay that. At New Learning Academy the owner pocketed the extra money. I didn’t find out until over a year after leaving that teachers can actually be deported if immigration comes to call. Conveniently “losing” employee paycheck receipts in order to pay less taxes on the wages. When one of my business students offered me a full-time job at his company, the owner of New Learning Academy sent him an email and lied to him, telling him that I wasn’t legally allowed to work there because of my contract with New Learning. Not only was my contract void because it was in English, but the job started after the 6-month period for which my contract was for. I almost lost the job because of it. Many school administrators throughout the country don’t know anything about teaching a language and don’t really care about the quality of the classes. The priority goes to filling as many classes as possible to make money. I will say that I have seen exceptions to this. My boss at my night classes was a certified teacher and he regularly stopped by to make sure my classes were up to par. Because schools and academies are run by people who don’t really know anything about quality teaching, the curriculum they use can be pretty bad. As a teacher you have to do your best to be creative with shoddy curriculum and lesson plans to facilitate successful classes. If you’re teaching on site, don’t expect to have access to computers, TVs, printers or copiers. The printer/copier situation was annoying because you have to go to a separate business to make copies or print something. It is super cheap, but you can’t do anything last minute. If you want to play games or make crafts, you’ll probably have to buy your own supplies, or request that students bring them. Teacher turnover is ridiculously high. Emergency subbing is a daily reality. In two months at New Learning Academy we lost over 15 teachers. It was a nightmare for the Academic Coordinator and the remaining teachers. (Add 5-10 extra hours to my schedule above to account for subbed classes, 68.5 hours in total). We lost so many for 3 reasons. First, because of the rampant corruption at our academy. Secondly, many people quickly realized that San Jose is not the paradise that they imagined for themselves. Thirdly, flaky teachers. A lot of people come to Costa Rica to explore and have incredible vacations first and teach English second. Therefore, you’ll see teachers come and go in a matter of weeks. This is true across the board and regardless of academy (although I imagine it’s not so much the case at places that help you with a work visa). If you know anything about Costa Rican culture, you know that Ticos are notoriously flaky (ask any Tico!). That goes double for students. When students do show up to class, they are a blast. I’ve never had better students. Unfortunately, it’s pretty common for only half of your class to show up. This is extremely frustrating because it can mess up your entire lesson plan or make a 3-hour class drag on forever. If you’re relying on private lessons, it can be a disaster because paying the rent might depend on students showing up. If you plan to teach on your own, be ready with a contract that either requires students to pay ahead of time and/or has a clause about paying for missed classes if they don’t notify you on time. If you’re teaching for most academies you should get used to the idea that you are disposable. There are always more teachers looking for work, you’re working illegally so you don’t have employee rights and they aren’t losing a lot of money training you. It’s ironic because the academies expect a lot from you—bad teachers won’t keep the students coming back. They want creative and fresh lesson plans and fast, measurable results. When I got offered the full-time job I offered to stay at New Learning and teach evening classes because we had recently lost over a dozen teachers in eight weeks but the owner was furious that I wanted to leave at all and said no. All the negative aspects of teaching English in Costa Rica aside, I don’t resent my time teaching here at all. I made amazing friends that I still talk to everyday, met lots of cool Ticos and learned how to live independently in a foreign country. I’ve even encouraged friends and students to teach here despite some of the bad experiences. Teaching opened a lot of doors for me and helped me decide what I want to do with my life. Having beaches, mountains and waterfalls right at my fingertips is just an added bonus.